Edward Fisher, Robin Youngs, Musheer Hussain, Jonathan Fishman,	The Journal of Laryngology & Otology, Volume 132 Issue 2, p 95. R Loh, M Phua, C-K L Shaw,	The Journal of Laryngology & Otology, Volume 132 Issue 2, pp 96-104. K Seresirikachorn, L Khattiyawittayakun, W Chitsuthipakorn, K Snidvongs,	The Journal of Laryngology & Otology, Volume 132 Issue 2, pp 105-110. K Akazawa, H Doi, S Ohta, T Terada, M Fujiwara, N Uwa, M Tanooka, M Sakagami,	The Journal of Laryngology & Otology, Volume 132 Issue 2, pp 111-116. Decompensated labyrinthine weakness presenting as de novo peripheral vertigo: a discrete clinical entity? A F Jahn,	The Journal of Laryngology & Otology, Volume 132 Issue 2, pp 117-121. N Patel, A Mohammadi, N Jufas,	The Journal of Laryngology & Otology, Volume 132 Issue 2, pp 122-128. 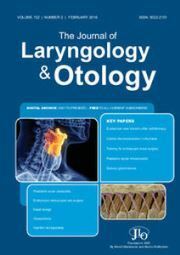 B Ulusoy, K Bozdemir, M Akyol, H İ Mişe, A Kutluhan, M H Korkmaz,	The Journal of Laryngology & Otology, Volume 132 Issue 2, pp 129-132. M Chan, S Carrie,	The Journal of Laryngology & Otology, Volume 132 Issue 2, pp 133-137. S Bailey, B Panizza, P Cabot, B Wallwork,	The Journal of Laryngology & Otology, Volume 132 Issue 2, pp 138-142. B Dawson, I Gutteridge, A Cervin, D Robinson,	The Journal of Laryngology & Otology, Volume 132 Issue 2, pp 143-149. Could seasonal allergy be a risk factor for acute rhinosinusitis in children? G Leo, C Incorvaia, A Cazzavillan, D Consonni, G V Zuccotti,	The Journal of Laryngology & Otology, Volume 132 Issue 2, pp 150-153. X-G Ni, Q-Q Zhang, J-Q Zhu, G-Q Wang,	The Journal of Laryngology & Otology, Volume 132 Issue 2, pp 154-161. G Pabst, K Strobel, J Zehnder,	The Journal of Laryngology & Otology, Volume 132 Issue 2, pp 162-167. D Chandran, C M Woods, M Schar, N Ma, E H Ooi, T Athanasiadis,	The Journal of Laryngology & Otology, Volume 132 Issue 2, pp 168-172. S S Kao, C Frauenfelder, D Wong, S Edwards, S Krishnan, E H Ooi,	The Journal of Laryngology & Otology, Volume 132 Issue 2, pp 173-179. J Mark, H Patwa, M S Costello, Y Patil,	The Journal of Laryngology & Otology, Volume 132 Issue 2, pp 180-183. G B Singh, S Shukla, P Kumari, I Shukla,	The Journal of Laryngology & Otology, Volume 132 Issue 2, pp 184-187. The Journal of Laryngology & Otology, Volume 132 Issue 2, pp -. Elfy B Chevretton, Irumee Pai, Sherif Haikel, Ann Sandison, Steve Connor, Ata Siddiqui,	The Journal of Laryngology & Otology, Volume 132 Issue 2, pp -.